At the risk of sounding like a raging alcoholic, sometimes we all just like to kick it back and have a cocktail or ten. 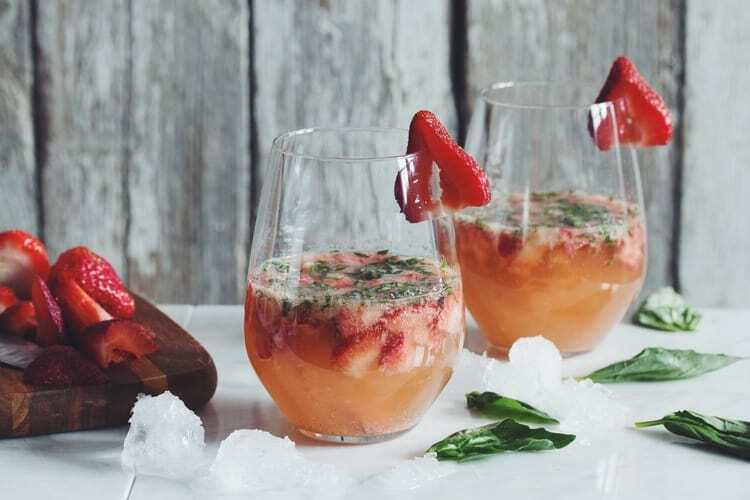 And with summer well and truly here, now is the perfect time to put your mixologist skills into motion and try your hand at making some vegan cocktail recipes for summer. The School of Public Health at Harvard University found that “moderate amounts of alcohol raises levels of high-density lipoprotein, HDL, or ‘good’ cholesterol and higher HDL levels are associated with greater protection against heart disease. Moderate alcohol consumption has also been linked with beneficial changes ranging from better sensitivity to insulin to improvements in factors that influence blood clotting….Such changes would tend to prevent the formation of small blood clots that can block arteries in the heart, neck, and brain, the ultimate cause of many heart attacks and the most common kind of stroke.” Woohoo! You know those really old people that are always interviewed on the news about why they’re so full of beans even after blowing out 100 candles on the cake? They invariably say the same thing: a drink a day keeps the grim reaper away. And research by the Catholic University of Campobasso backs that up – apparently drinking less than two drinks per day for women could reduce the risk of death by 18 percent. This is, of course, another feature of the Mediterranean diet, where wine is an integral part of dinner or lunch. But of course, that rules binge-drinking out completely. Sorry, Brits! Results of a Dutch study showed that healthy adults who drink one to two glasses per day have a decreased chance of developing type 2 diabetes compared to those who don’t drink at all. 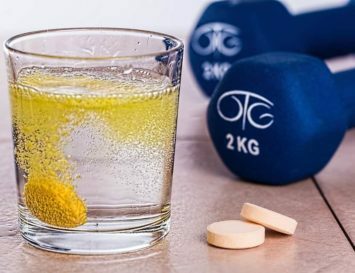 The study states that moderate alcohol consumption can play a part in a healthy lifestyle to help reduce the risk of developing type 2 diabetes. Yeah, we know what you’re thinking: duh, right? But we’re talking about men here: contrary to popular belief, research shows that moderate drinking might actually protect against erectile dysfunction in the same way that drinking red wine might benefit heart disease. A 2009 study claims the chances of erectile dysfunction were reduced by 25 to 30 percent among alcohol drinkers. According to the journal Neuropsychiatric Disease and Treatment, moderate drinkers were 23 percent less likely to develop cognitive impairment or Alzheimer’s disease and other forms of dementia. Small amounts of alcohol might make brain cells more fit. Alcohol in moderate amounts stresses cells and thus toughens them up to cope with major stresses down the road that could cause dementia. But keep in mind: this only works for very moderate amounts of alcohol. Like, no more than a drink a day. 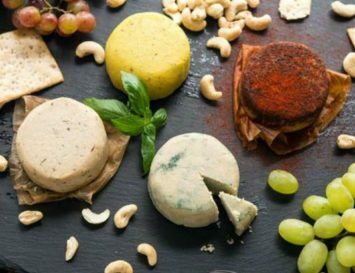 You may be surprised to discover that though they’re based on fruits and veggies, some cocktails actually rely on non-vegan ingredients to make them, including eggs, cream and even dyes extracted from insects. Gross, right? Well, there’s a few ways for you to keep your beverages vegan friendly this summer, starting with websites like Barnivore which list all vegan friendly wines, beers and spirits, making it easy to identify those that are safe to consume. You can literally type a brand in and check whether or not it’s safe to go into your cocktail. 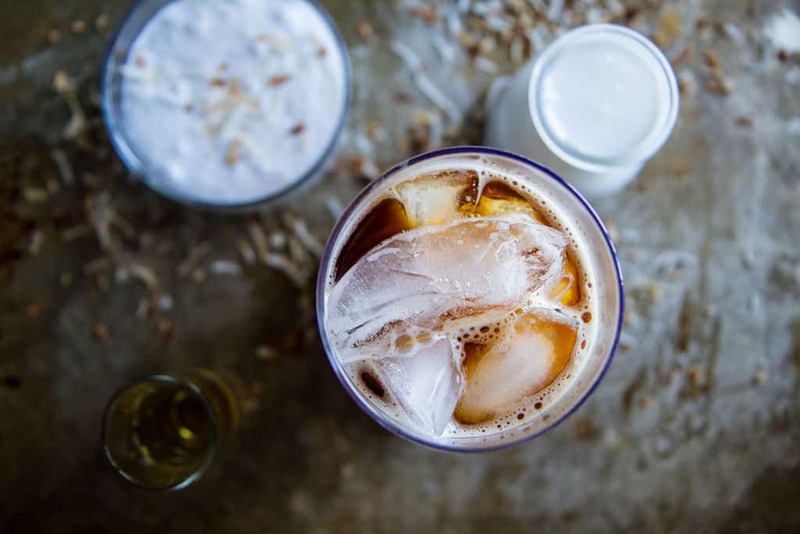 Of course there are more obvious ways to keep your cocktail vegan friendly – if you’re making a cream based cocktail, you can alternatively switch it up with soy or almond milk so it’ll still have that creamy edge. Missing your bloody Mary without the traditional (anchovy based) Worcester sauce? Tamari, my friends, will work wonders. If a recipe calls for a syrup, it’s relatively easy to make your own, holding power over what exactly goes into it. And now let’s talk sugar. There’s a lot of vegan confusion over refined sugar due to the fact that some sugar brands are processed with animal bone char to filter it. This doesn’t go into the sugar but it is used in the filtering process, so if you want your cocktail to be 100% vegan friendly, use agave syrup (which blends better in liquid anyway), or unrefined sugar. Obviously I know that not all of us like to sit down to an alcoholic drink as a treat and prefer to steer clear of alcohol, and that’s perfectly fine. But why not still enjoy a cocktail, minus the alcohol? Meet the Mocktail! I’ve included a few mocktail recipes for those of you wanting to have a cocktail and skip the hangover. Now, where’s that cocktail shaker . . . Blood orange and ginger go perfectly well together. 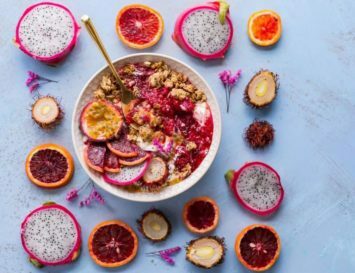 Blood oranges can be sweet with the citrus edge and the ginger lends a subtle spiciness. And garnishing glasses is a must. It just looks so pretty! Did you know gin has many health benefits and is also lower in calories than beer and wine? After all, it was developed as an alternative health remedy before it became a social drink. There’s a reason the Queen Mother lived to be over 100, you know – she said she had a glass of gin at 4pm every day! 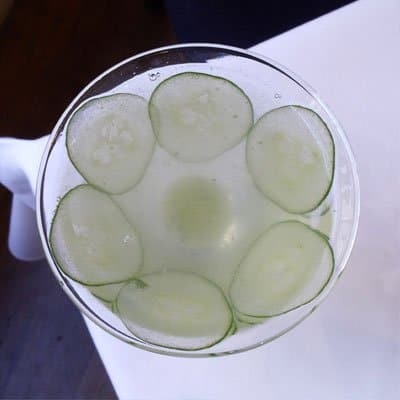 The cucumber here will keep you cool on the hottest days, and also adds a nice shot of much-needed hydration. Although by now you’re probably thinking I’m a raging alcoholic – I swear, I’m not, I’m just British – I’m not actually fond of strong tasting alcoholic drinks. You don’t want to be reminded that you’re chugging vodka, do you? So this is the perfect Gin cocktail with a really subtle alcohol edge. 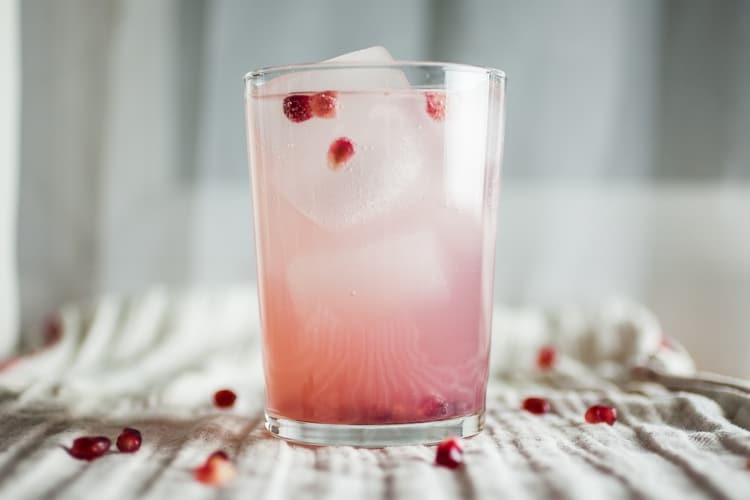 It’s blended with fresh pomegranate seeds and a gin created from grapes, giving it a nice floral edge and making this a light drink to enjoy. Garnish it with a handful of pomegranate seeds, just because, y’know, it looks pretty cute! 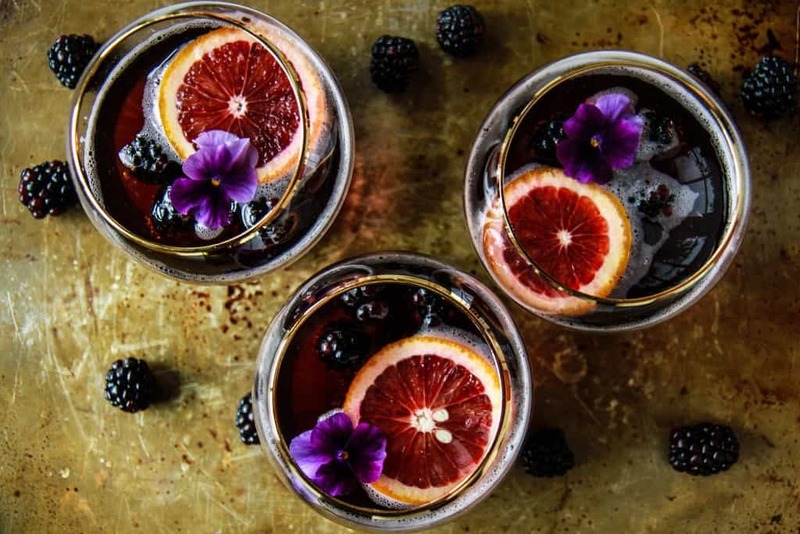 Sangria is really one of those drinks that everyone seems to enjoy, and it’s much, much better to make your own from scratch than buying a ready made bottle. 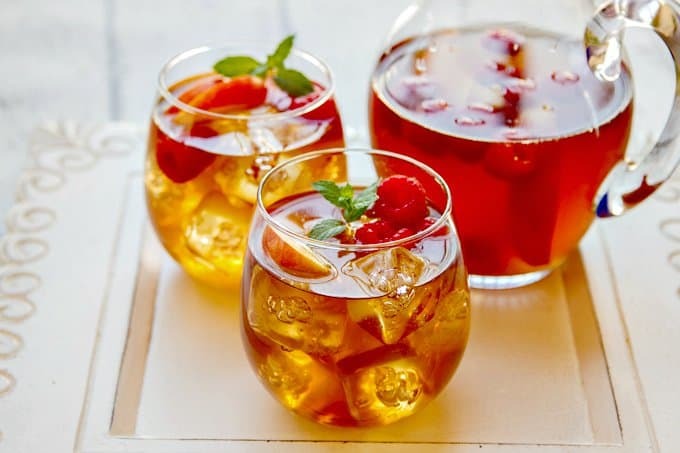 The sweet tea in this is going to revamp your love of sangria, and the addition of fresh fruit is a must. The best part of sangria after all is finishing the glass and having sangria infused fruit to nibble on afterwards. The name of this cocktail surely has ‘mule’ in it because it gives a nice kick! 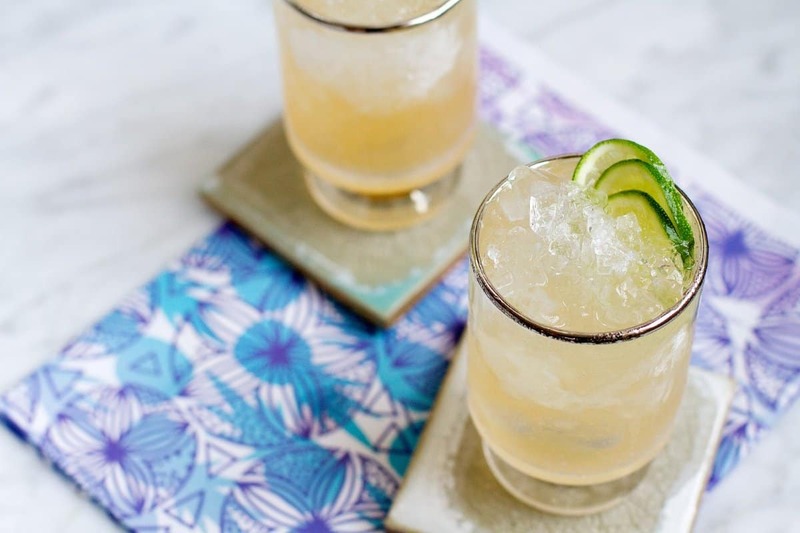 Mezcal will leave you feeling super relaxed, and the guava lends a sweet touch to the alcohol’s naturally smoky flavour. 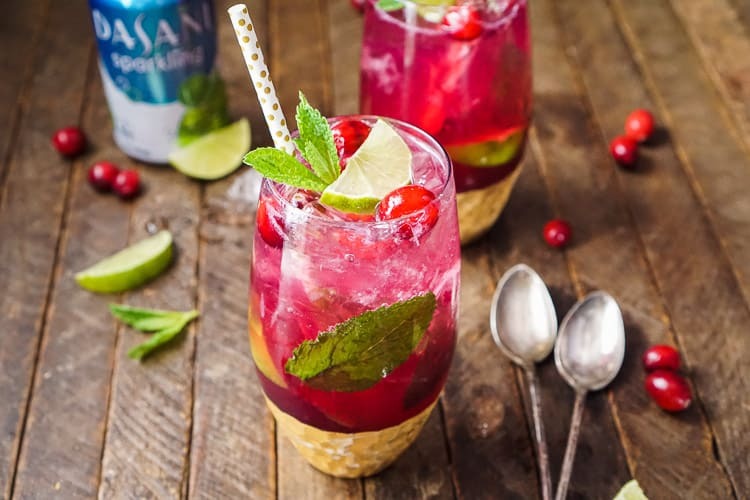 This looks summery, but would also make the perfect Thanksgiving cocktail, thanks to the cranberries. 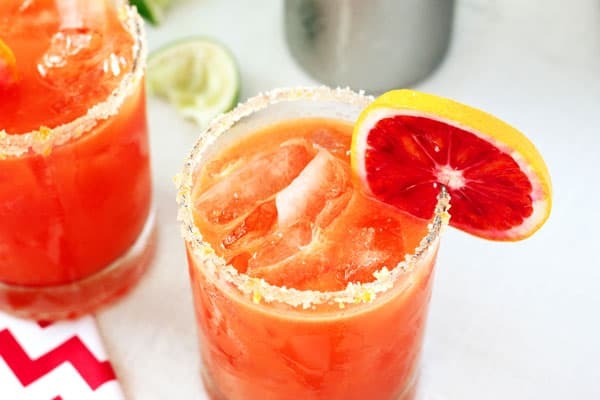 They’ll also protect you from a bladder infection, and add a bit of vitamin C to your drink, meaning you won’t be damaging your body quite as badly as you would with straight up booze. This one looks like a sunset! 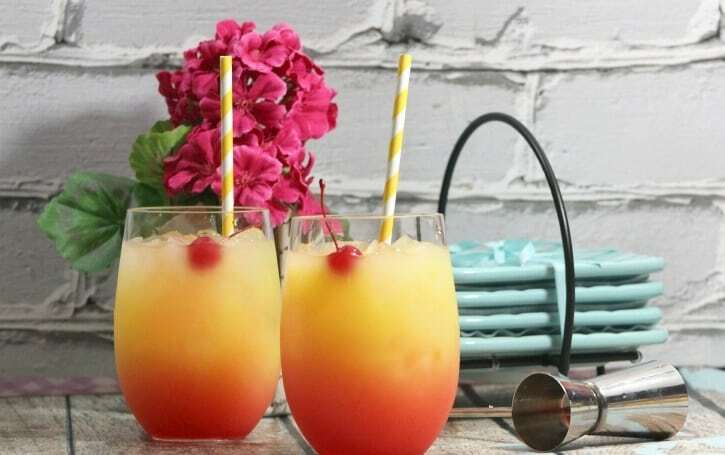 Or perhaps, a tequila sunrise, depending on how you look at it. The lovely red comes from Grenadine, of course, a strong red syrup made from red currants and pomegranates. 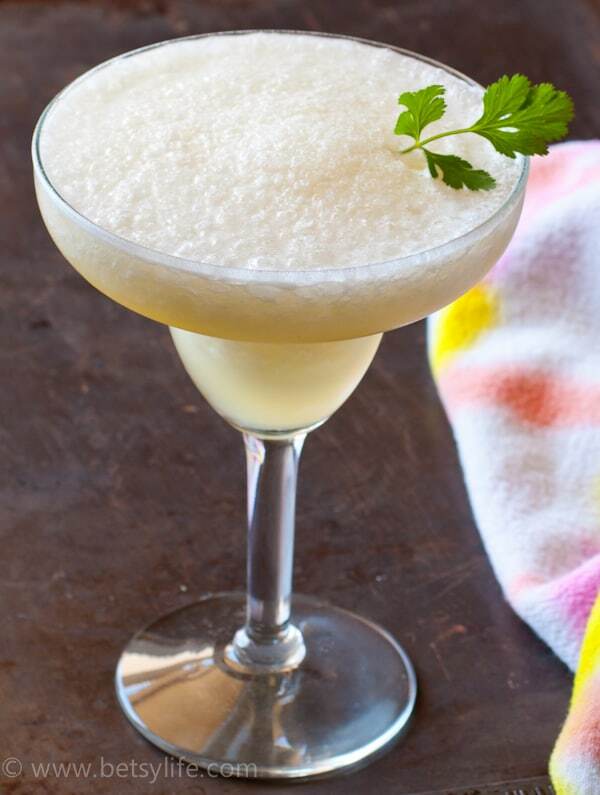 It is a useful ingredient for many cocktails – just make sure yours is a healthy one like this, not made from artificial ingredients or colours. Oh, and did you know the way they make Maraschino cherries is nothing less than horrifying, involving high fructose syrup, artificial colours and flavours and chemicals? Avoid, avoid, avoid! Add a real cherry garnish, or a cranberry instead! What could be more classic than both gin and elderflower? 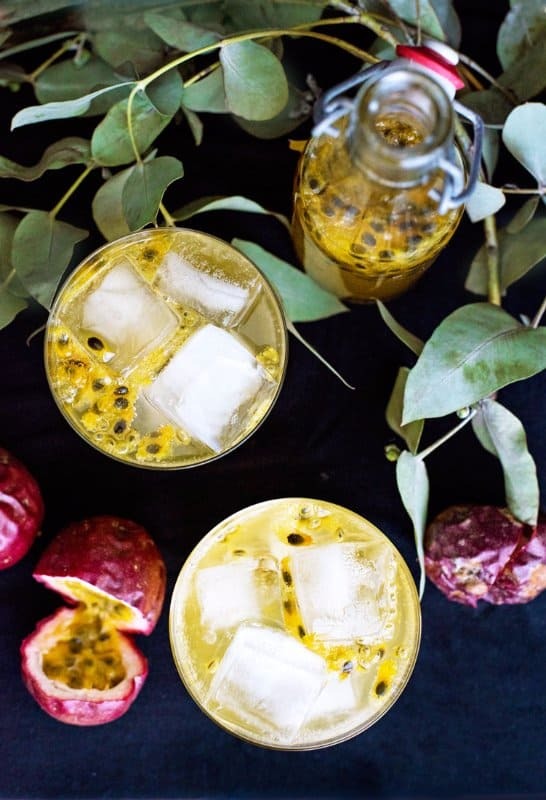 It tastes like an elderflower cordial, but just a little bit more fun; the sweet and musky perfume of elderflower pairs perfectly with the classic juniper taste of gin. 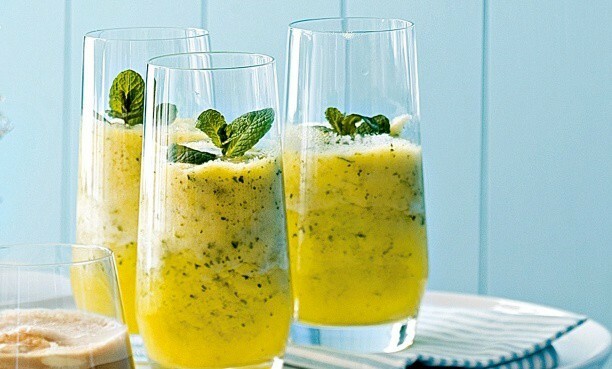 Serve with cloudy English apple juice & a sprig of mint, or mix with lemonade & freeze for some very grown-up ice lollies. The pungent sweetness of passionfruit will sweep you back to your favourite tropical holiday. This is pretty simple to make, and it also converts easily to a nice mocktail, too. You can almost hear Jimmy Buffet singing about this one, right? If you can’t make it to a tropical beach this summer, bring a piece of the beach home to you with this irresistible punch – little umbrellas optional! 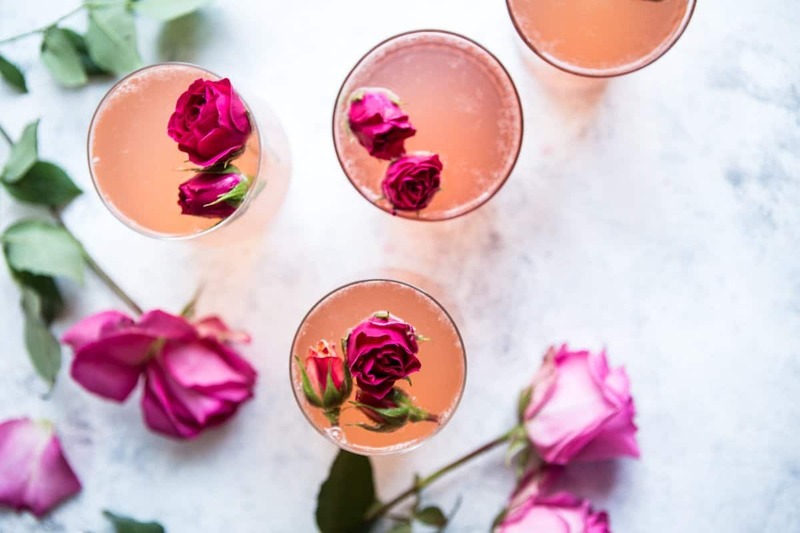 Take the garden tea party or bridal shower to another level with these rose and lemon spritzers. They look absolutely gorgeous with a few rose petals floating in them – just make sure those roses are organic, or you’ll be ingesting a whole lot of pesticides. Ew! 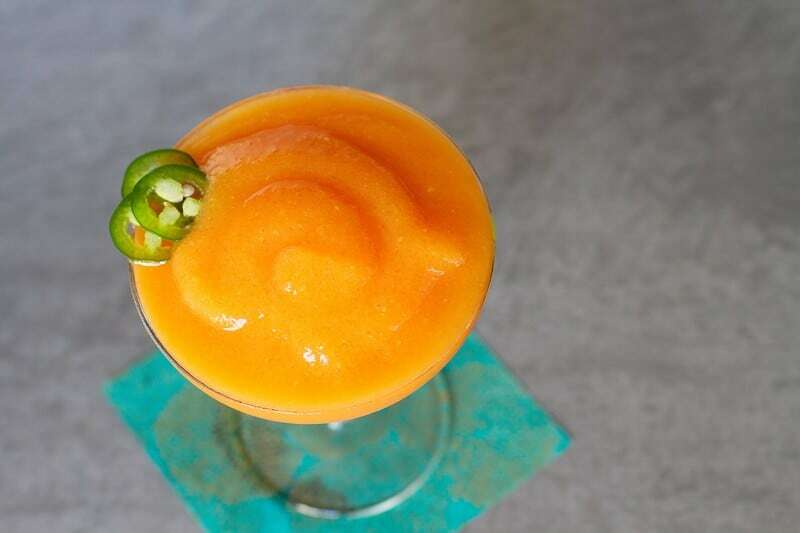 When it’s really, really hot and you are actually craving something that will give you brain freeze, this smooth, frozen concoction is your drink. But don’t worry – that nasty sensation in your head won’t last long thanks to the tequila in this cocktail! They’re in season, so why not make the most of strawberries? 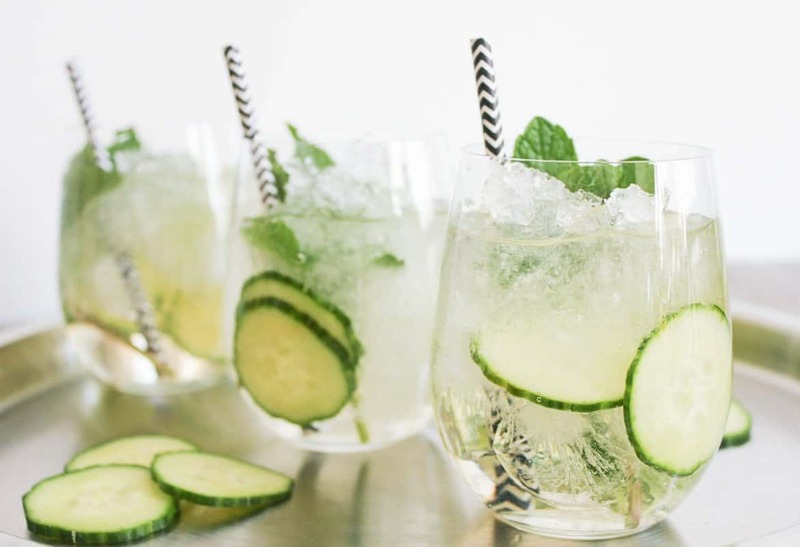 They add a nice, sweet edge to the traditionally citrusy mojito. 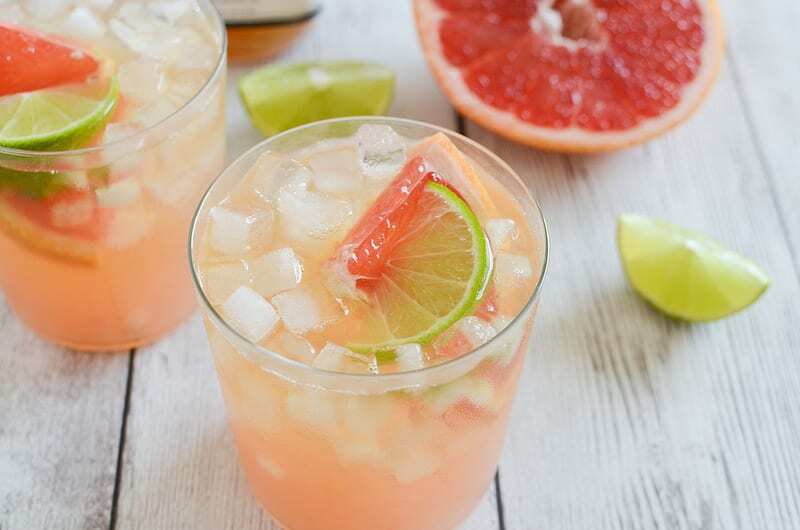 Another super-refreshing citrus based drink – but this time, with bourbon! You’ll imagine you’re out somewhere in the American South, sitting on a porch and talking about the heat with someone with an accent like Tennessee Williams. And after 3-4 of these, you’ll be convinced that’s true…! 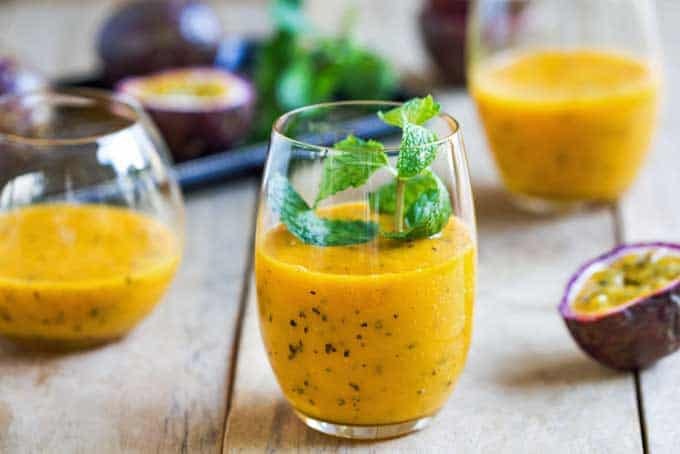 The ingredients of this one almost sound more like a smoothie than a cocktail! 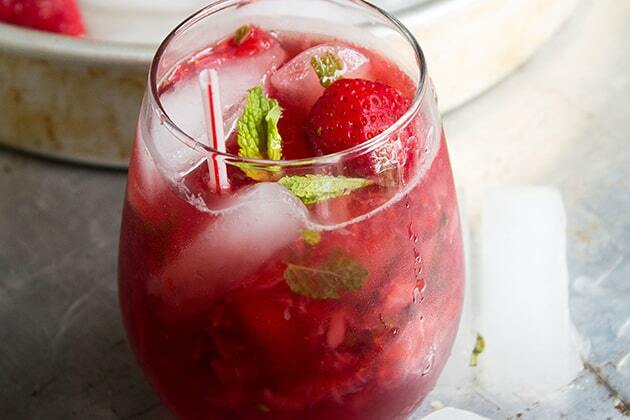 It’s got vitamin C and sweetness from the berries, a zing from the ginger, and a bit of refreshment from the basil. Again, if you’re vegan, ensure your prosecco is an animal-free brand like La Jara; a lot of proseccos are filtered with fish scales. Yuk. Can’t you just imagine Tim Burton or Morticia Adams serving these at their summer fete? Which would be held at night, of course. Under a full moon…The blackberries blend perfectly with blood oranges to make this a bittersweet treat, and adding little violets or pansies (organic, pesticide free, remember?) make this cocktail super chic. 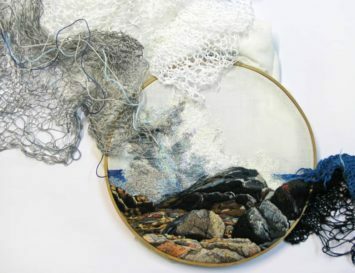 This is my very favourite one of all! If, like me, the summer heat makes you sleepy, then the coffee will give you a kick. Meantime, the rum will make you relaxed. It’s the perfect place to be! The coconut milk adds a bit of a summer flavour, too. 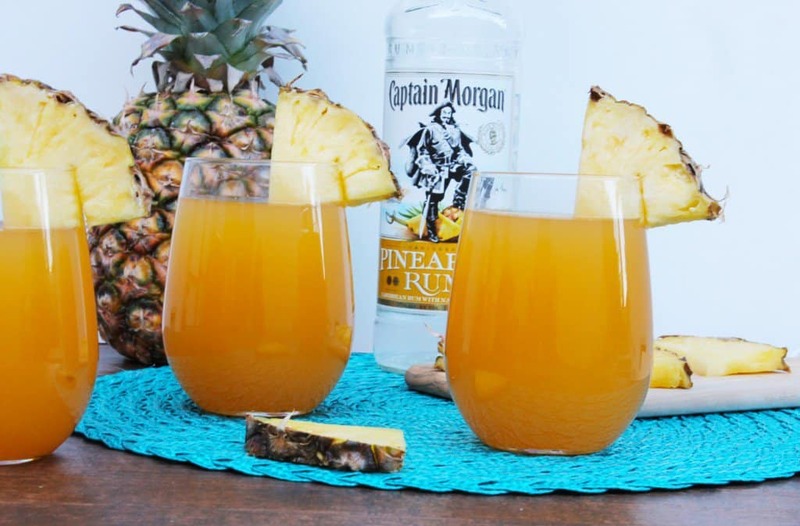 Did you know your typical Pina Colada has around 400-600 calories? Whaaat??! That’s mainly thanks to the coconut cream. Take the calorie count down a notch but enjoy all the flavour by adding coconut water instead of the cream. This is so healthy, I could imagine it being served at the gym! Using a juicer, blend one cucumber, two celery stalks, one head of romaine lettuce, one lemon, one small piece of fresh ginger, and two green apples. Then, add vodka to taste. So now we’re entering ‘mocktail’ territory. Basically, that’s a bunch of blended juices and flavours. But let me make it clear that of course, any of these could use a shot of booze, and conversely, any of the recipes above could remove the booze for those who avoid alcohol. This minty, fruity drink is refreshing, no matter what you do! 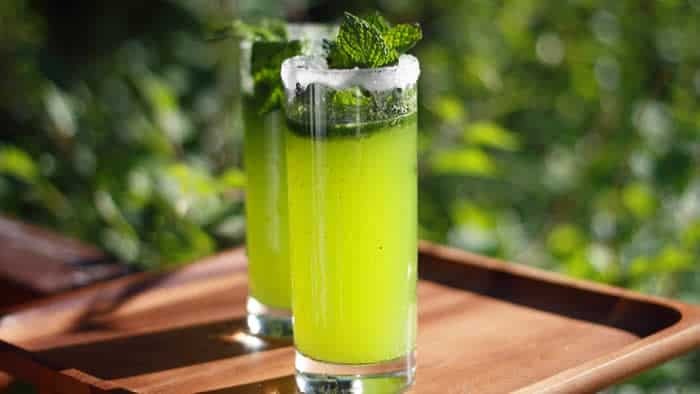 People love mojitos for their sugary mintiness, and this mocktail emphasises those flavours beautifully, making it a refreshing treat on a hot summer’s day. 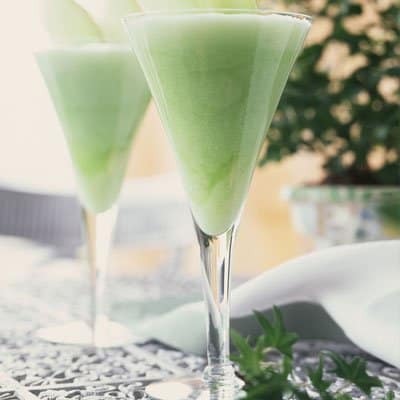 Thing is with cocktails – they look so pretty, and are great to serve at parties! 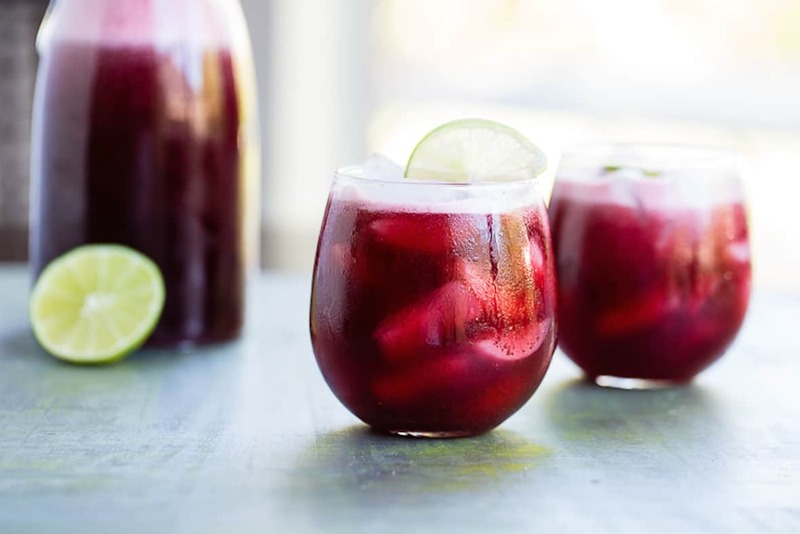 This drink makes the most of summer cherries, and the hibiscus adds even more vitamin C and minerals to ensure this is a health elixir as well as a yummy mocktail. Dessert or mocktail? You add a scoop of ice cream in this to make it the former, or some ice to make it the latter. In any case, it’s going to cool you right down. A quick note, store bought oj isn’t vegan. Nor is ruby red grapefruit juice. Nor is, usually, bottled fruit punch. 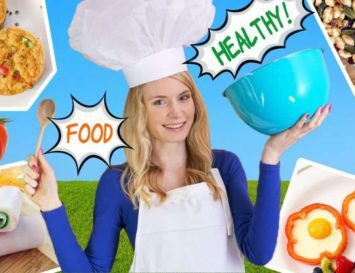 If the recipes offered here *are* in fact vegan, brands would be nice to know otherwise, it’s slightly misleading to say the recipes are “vegan”.